DISCLAIMER: Very MILD spoilers. I did my best. You’re welcome!!! This one quote is the best way to summarize Dracula’s pain. Ironically, it was said to him by his own son, Alucard. 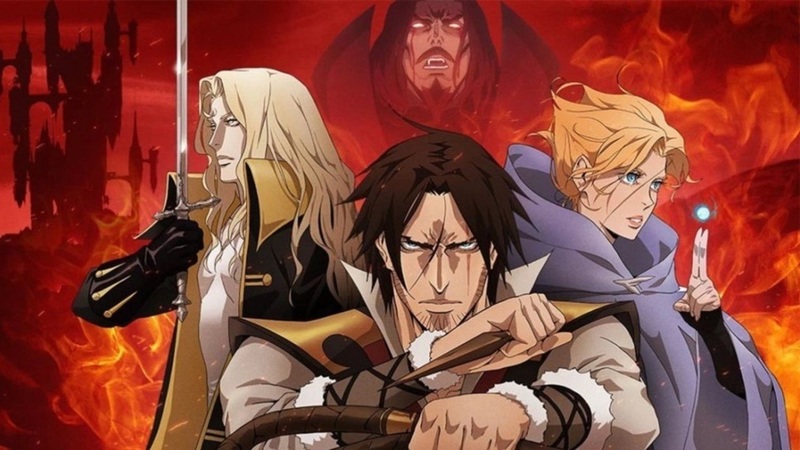 Season 2 of Castlevania was definitely well needed after the first season came and went with only 4 episodes. Many complained, but I wasn’t too bothered because it was well planned out. It was snack loaded with brain candy and exciting character development. 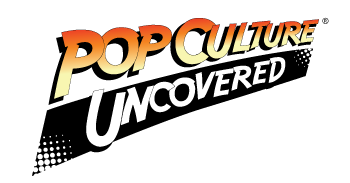 In the world of animation, it’s not new for stories that were originally video games to become cartoons. 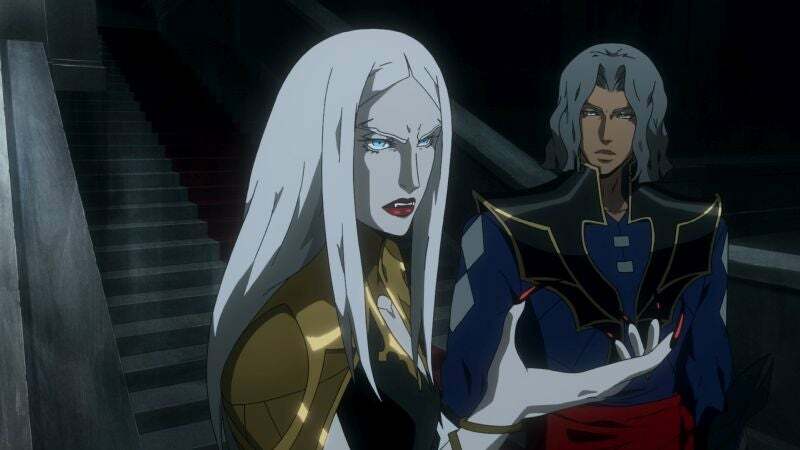 Sometimes it’s a hit and sometimes it’s a tragic flop and Castlevania is far from a tragedy in terms of entertainment. 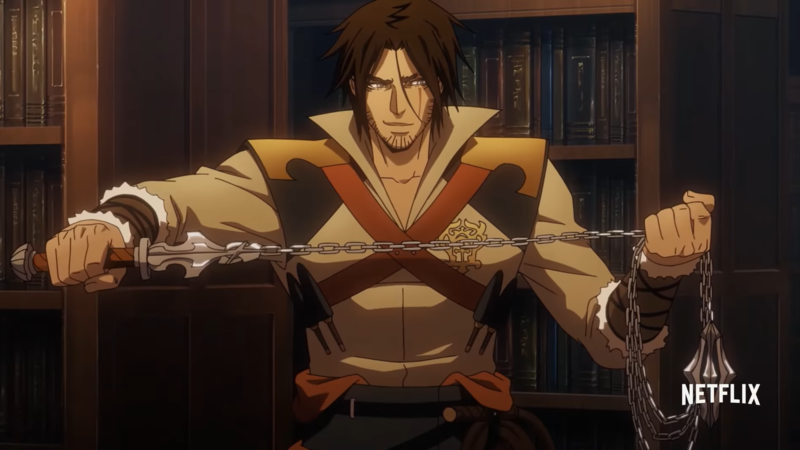 In case you missed Castlevania season 1, here is a recap. Dracula falls in love with a human woman who wants to develop better medicines for people using his knowledge and science. They get married and she convinces him to get in touch with humanity. While he does that, the Catholic church sees her medical work as witchcraft and burns her at the stake. Dracula comes home to learn that his wife was murdered by the church and he threatens not just the church but all of humanity that in one year, he will come back to ruin them. On the anniversary of his wife’s death, instead of repenting or mourning, there is a celebration by the church about how they killed the wife of Satan Dracula. The party was interrupted by Dracula and he unleashed his hellish army of demons on the town, and so started the war on humanity. 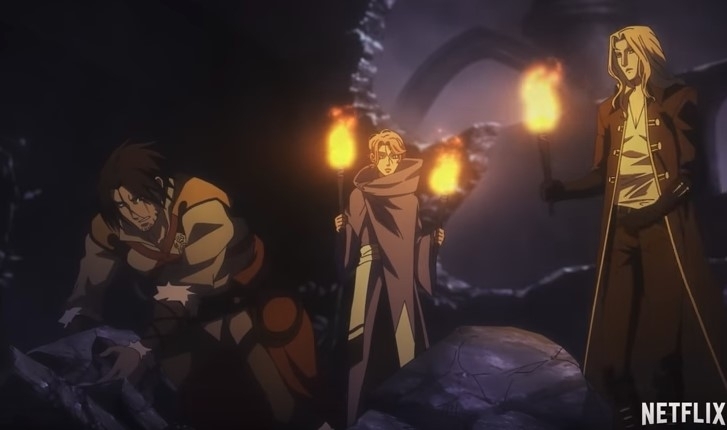 Now, with that recap under our belt, season 2 picked up with the 3 heroes of the prophecy of season 1, coming together to takedown Dracula and his army: Trevor Belmont the hunter, Sypha Belnades the magician, and Alucard the son of Dracula or the sleeping warrior. In this season, we finally learn more about the Belmont Family and who exactly they were. This family was almost equivalent to the Hellsing Family in terms of hunting vampires, but unlike the Hellsing Family the Belmonts were researchers, collectors, and hunters of all supernatural beings. With that being said, their knowledge, despite how they collected it, was key to winning to war with Dracula. Later on in the season, Trevor took his comrades to his childhood home which was in ruins to find the secret door that led to the true house of the Belmont family, their collection and research library. While the 3 were in the library collecting knowledge and weapons to defeat Dracula, there was a waft of betrayal brewing in Dracula’s army. We learned that Dracula’s army isn’t just him and a few hundred-thousand hell demons, but also vampire generals, their own soldiers, and 2 human generals leading them. If you’re asking why there were 2 humans with Dracula, you’re in the same boat as me and the generals. Dracula answer was that they knew humans better than anyone and knew how cruel and useless they are. If anyone was going to truly destroy humans, it would be humans. In the weirdest way, that was the most truest statement every said and it’s always amusing how lines like that come from those who aren’t human and can give constructive commentary on how destructive and primitive humans can be. Anyway, to get back on track, one last general came and it was Carmilla. When she arrived, I knew it was bad news and I knew if anyone was going to exploit any cracks in loyalty, it would be her. If you don’t know vampires, Carmilla is a vampire queen who loves to bathe in blood and mayhem. If you’ve seen Vampire Hunter D: Bloodlust then you know she is beyond taking down her own kind to achieve her own goals. That version of her is no different in season 2 and she is a brilliant mastermind. While Dracula slowly wallows in his own pit of misery, she slowly plots in silence even enlisting one of his own generals, yeah a human one, into helping her plan move forward. To me, it was very transparent and almost too easy, but still was a nice addition to the storyline. All in all, here are my thoughts. I was expecting a lot from season 2 because the last season was half the amount of season 2 and there was a sizable amount of time to wait for season 2. I wasn’t disappointed. Referring back to the quote by Alucard, it was clear to me that Dracula and his rage died within the year he promised to the humans. He began to look less like a bloodthirsty monster and more like an old man in mourning and wanting the world to feel the same way as him. This war was a suicide note by Dracula and it was both tragic and pathetic. Alucard said numerous of times that his mother, Lisa, wouldn’t have wanted Dracula to do this and that she would’ve wanted Alucard to stop his father from taking humanity down with his depression. Lisa apposed her son being named Alucard, which is an anagram of Dracula, because she didn’t want her son to parallel his father but to be his own person. To me, her words rung true not just for Alucard but for Trevor as well. Both men lost their way due to tragic events and lived coldly. Trevor lost his childhood at 12 due to his family and house being burnt down. Alucard who had his mom taken from him by his own kind and could do nothing but watch her die from afar. ; while also having a father go through a painfully lonely mourning while dishonoring the woman they both loved. Even though they tried to kill each other in episode 4 of season 1, they’ve become loyal comrades who helped save humanity and each other from darkness and despair.